Deck plants provide a graceful transition from the distinctly indoor space of your home to the distinctly outdoor space of your yard. Attractive planters filled with flowers, herbs and shrubs can transform your deck into a cozy and inviting outdoor "room." These planters are designed to be used either as enclosures for potted plants or to be lined with landscape fabric and filled with dirt. 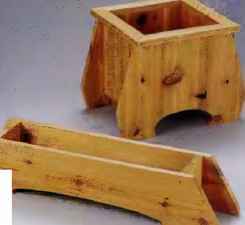 We built these planters for a cedar deck; for best results, build yours from the same material as your deck.